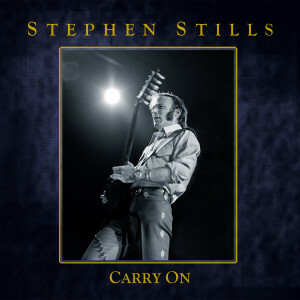 The much-anticipated Stephen Stills “Carry On” boxed set is due from Rhino Entertainment on March 26, four CDs stuffed with classics and rarities spanning the first 50 years of the singer, writer, multi-instrumentalist, producer and bandleader’s colorful career, from the edge of 17 to just last year. Produced by Graham Nash and Joel Bernstein with Stills, “Carry On” includes essential recordings, live cuts and new mixes. Of the 82 tracks included, 25 are previously unreleased. A 113-page booklet is packed with rare photos and extensive liner notes by Michael O’Hara Garcia, David Bender, and NY Times best-selling author Daniel Levitin. The set’s list price is $54.98; a digital version will also be available. Each iteration includes more than five hours of music. Stills, who turned 68 on Jan. 3, has released more than 250 songs since 1966, some solo, others with iconic bands including Buffalo Springfield, Manassas and, most famously, with David Crosby, Graham Nash and Neil Young. In retracing the remarkable scope of Stills’ career and the musical paths he has explored over half a century, the producers show he’s more than a prolific hit-maker (“Love The One You’re With,” “Southern Cross”). He’s also a songwriter who speaks his mind (“For What It’s Worth”) and his heart (“Suite: Judy Blue Eyes”) equally well, and is comfortable playing and mashing up diverse genres including folk, rock, blues, jazz, country and Latin. The “Carry On” tracks unfold mostly in chronological order, leading off with the collection’s oldest entry: “Travelin’”— a previously unreleased recording Stills made in 1962 at age 17 in Costa Rica (one of the many places he lived growing up in a military family). The newest track, recorded only a few months ago, features CSN performing “Girl From the North Country” in New York City during a sold-out five-night run at the Beacon Theater that closed the group’s acclaimed 2012 world tour. “Carry On” features more than an hour’s worth of previously unreleased material including “No-Name Jam,” a 1970 recording of Stills in London trading guitar licks with his friend Jimi Hendrix. Other previously unissued highlights include the songs “Welfare Blues” (1984), “Little Miss Bright Eyes” (1973) and “Who Ran Away?” (1968), and early demo versions of “Forty-Nine Reasons,” “The Lee Shore” and “Black Coral,” the latter a song Stills and Young released as a duo in 1976 — the version here features all four members of CSNY. “Carry On” also features a number of classic songs newly remixed by Nash and Stanley Tajima Johnston, including “Everydays,” “To a Flame,” “See the Changes,” “4+20” and “Change Partners,” the latter with Jerry Garcia on pedal steel guitar. There is also a newly edited version of Stills performing “Cuba Al Fin” at the Havana Jam in 1979. Other famous players turn up on “Carry On” as well, including Herbie Hancock, Eric Clapton, Maynard Ferguson, Ray Baretto, Willie Bobo and Larry Harlow. Special thanks to Jason Elzy and Michael Jensen.